The rise of emerging technologies – artificial intelligence, machine learning, wearables, virtual and augmented reality – is shifting design. We’re moving away from making objects to generating whole “experiences of becoming.” These experiences need not take place in person or online but in overlapping worlds. While some panic at this dissolving boundary, others see new opportunities. To paraphrase Idea Couture CEO and cofounder Idris Mootee, what’s changed when designers no longer focus on designing a car, but instead, the driver’s whole experience of the car? These questions were front and centre at Digifest, an annual tech conference and startup event celebrating digital creativity. The Canadian Film Centre Media Lab’s (CFC Media Lab) IDEABOOST community has participated in past versions of its pitch competition, such as our IDEABOOST Accelerator alumni Think Dirty and Albedo Informatics. 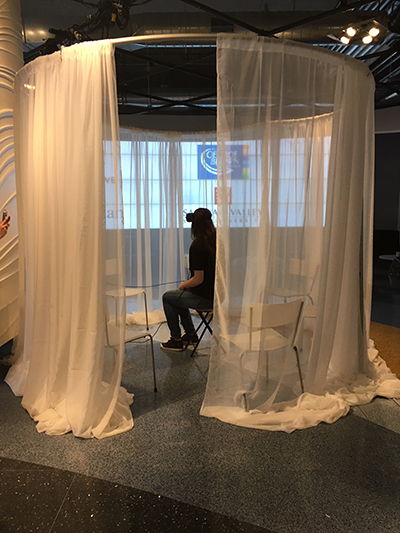 This year, Network Connect company, Impossible Things, brought a sampler of their popular Art Gallery of Ontario show, ReBlink (featured in this recent story). Three key takeaways emerged from this year’s talks, revealing how design is generating these “experiences of becoming” in practice. I. The “information economy” has splintered into multiple, often overlapping worlds. Digifest revealed how much we now inhabit overlapping, plural economies defined by how we encounter information. The idea of a singular economy organized around industry or information, for example, has dispersed. L-R: Moderator Matt Humphreys (Chief Experience Officer, Diff) guides a discussion between Adriana Ieraci (Founder, Get Your Bot On! ), artist and curator Nina Czegledy, Sujeevan Ratnasingham (Founder, Life Scanner) and Jonathan Moneta (Creative Director, MakeLab). Jonathan Moneta called it the “maker economy,” with 3D printing enabling de-industrialization and a rise in micro-factories, as individuals gain the means of production for themselves. Sujeevan Ratnasingham emphasized our “social economy,” in which the saturation of experiences online lead to more personalized, targeted, in-person experiences – which in turn feed back into stories and experiences on social media. Nina Czegledy focused on how much we are now living in a “data-based economy,” in which data-capture, measurement, analysis and stats irreducibly shape our experiences, albeit behind the scenes. II. Machine learning may not lead to a Westworld dystopia, but rather, to more personalized encounters. 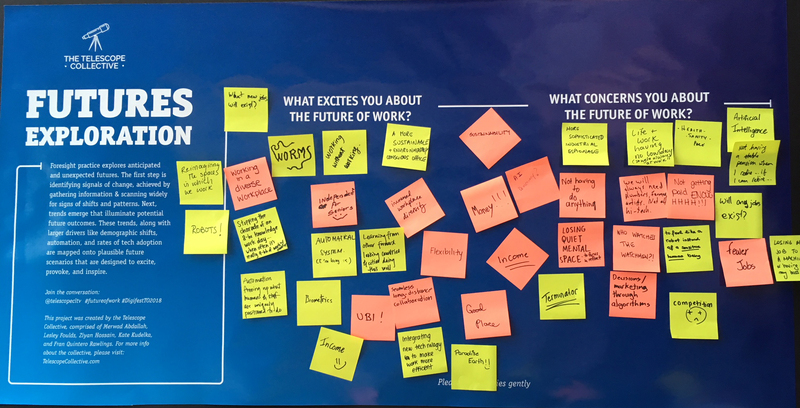 The Telescope Collective captured Digifest participants’ hopes and fears about automation at work. In other words, robotics research may, and should, honour and explore its own effects on human experiences more as a component of its research. III. Experiences are neither digital nor analog alone anymore, but dynamically both. Keynote speaker Linda Volkers, marketing manager of the Netherlands’ Rijksmuseum and manager of #Rijkstudio. 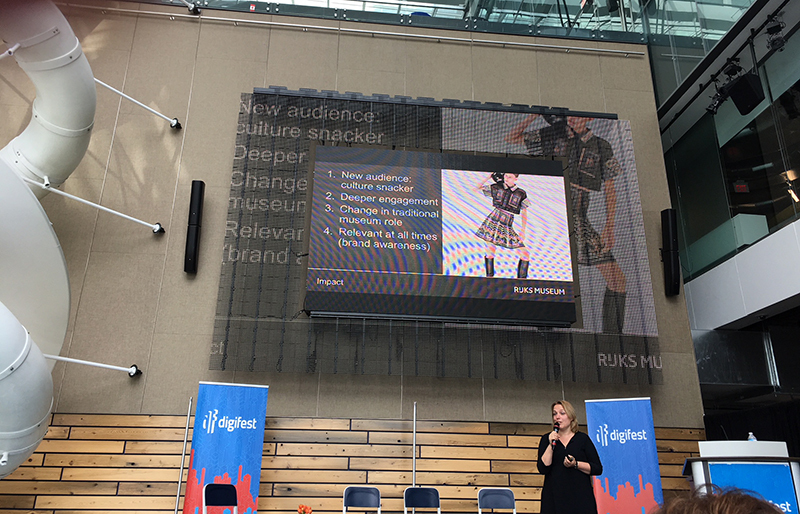 Keynote speaker Linda Volkers, marketing manager of the Netherlands’ Rijksmuseum and manager of its innovative open-source digital wing, #Rijkstudio, explored how digital engagement and in-person experiences feed each other. Here, an experience of the museum isn’t simply about getting people in the door or online. It’s always a mix of both. Since 2010, the Rijksmuseum has been digitizing its entire collection of 350,000 pieces, with an anticipated end in 2019. The collection has continued to be available in high-res form online for anyone online to visit, peruse, download, curate and use in their own art/commercial practice, all for free. As a result, “visiting” the museum has transformed. People can access the collection at the popular #Rijksstudio website and app; indeed, the app’s playful experiential tagline, “Put the Rijksmuseum in your pocket,” alludes to the museum’s successful mobile-first strategy. Digital engagement has soared, not surprisingly, but so has in-person attendance, with more people entering the museum to both view and draw art more, and more international entrants over four years of the popular Rijkstudio design award competition. 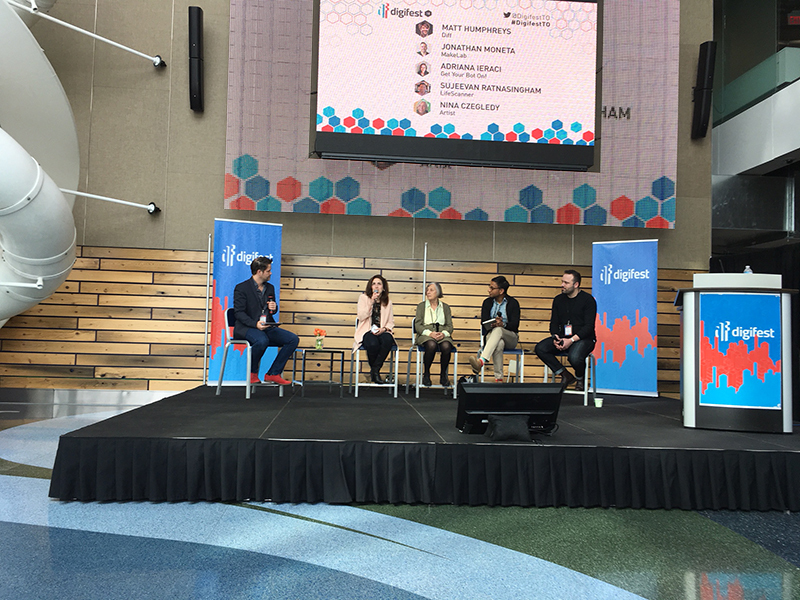 Overall, as these three takeaways suggest, Digifest fostered rich connections and insights. It inspired us to rethink how digital tools and technology might be shaping our own “experiences of becoming” closer to home. Congratulations to the organizers, the Digital Media & Gaming Incubator at George Brown College, on a successful event, and to all of the companies in the IT’S A START pitch competition, especially this year’s winners: Grand Prize, InStage; Second Prize, Cool Cat Innovations; Third Prize, Phyxable; and People’s Choice, Communihelp.